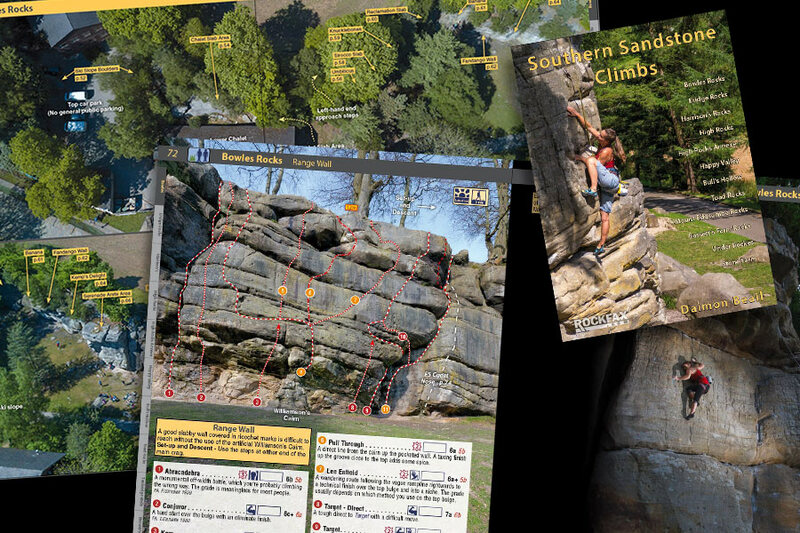 The long-awaited Southern Sandstone Climbs Rockfax guidebook is now available for pre-order at a speical offer price of £24.95 (RRP £34.95). The guidebook is due to be published week commencing 11th September 2017, and pre-order copies will be sent out as soon as stock arrives. To pre-order your copy go to the Rockfax.com website. Tucked away in the southeast of England within woodland and valleys, surrounded by rolling hills, and lush green countryside are the beautifully hidden crags known as ‘Southern Sandstone’. On the borders of Kent and Sussex, the sandstone outcrops are within easy reach of London and Brighton and is one of the busiest climbing destinations in the UK! The book covers 12 different crags and includes selective routes and boulder problems, accompanied using the familiar Rockfax style of big-topos, clear descriptions and inspiring action photographs. It is the first sandstone guide to incorporate the French sport grading system, alongside the traditional UK tech grade. Harrison’s Rocks (the largest sandstone crag in the southeast) and Stone Farm are both owned and maintained by the BMC and managed by the HRMG (Harrison’s Rocks Management Group). The other crags are owned by either local authorities, wildlife trusts or are on private land and access has been negotiated and granted with various conditions in place. The sandstone presents many unique features – strenuous honeycomb walls, crimpy technical masterpieces, tenuous stretches on rounded breaks, thuggy struggles up cracks, powerful pulls over bulging roofs and some of the most interesting off-width and chimney climbs in the country. Whatever your style, there should be something to suit here. The sandstone is a much softer close relation to the rock found in Fontainebleau. This delicate rock brings great responsibility to climbers to ensure it is not damaged or eroded. Only top-rope and solo climbing are allowed, since any lead climbing gear would not hold and would damage the rock. First-time visitors often struggle with the unique and delicate climbing style, and the short and intense nature of the climbs means they pack a lot in. However, once mastered, there is a great deal of pleasure and satisfaction to be achieved by pushing your grade and tackling some of those iconic testpieces! Sandstone is basically just compressed sand with a thin weather-hardened outer layer. Once the outer layer is worn through, the sand underneath will erode rapidly if rubbed or left untreated. Holds often collapse through overuse, particularly where excessive brushing has taken place. There is, therefore, some simple and important rules to be followed known as the Southern Sandstone Code of Practice. Unlike any other climbing area in the UK, the specific requirements regarding access, gear, top-rope set-up and climbing technique on Southern Sandstone are vital in helping preserve the rock for present and future generations of climbers. Rockfax is the first sandstone guide to incorporate the French sport grading system. Grades have always been a contentious issue on sandstone. For years, the standard method has been to give each route a single UK technical grade, which aims to give an indication of the hardest move on a route. This works to an extent, but can give a false impression of how difficult a climb actually is overall - a route with one UK6a move has the same grade as one with six UK6a moves without a rest, yet one is obviously harder than the other. Another problem is that historically the UK technical grade has become very limited at the top end with a huge variation in difficulty within some of the top UK 6a, 6b and 6c grade bands. This stands out where UK technical grade 6b spans French sport grades from 7a to 8a! This guide has been a passionate and time-consuming project spanning the past five years. 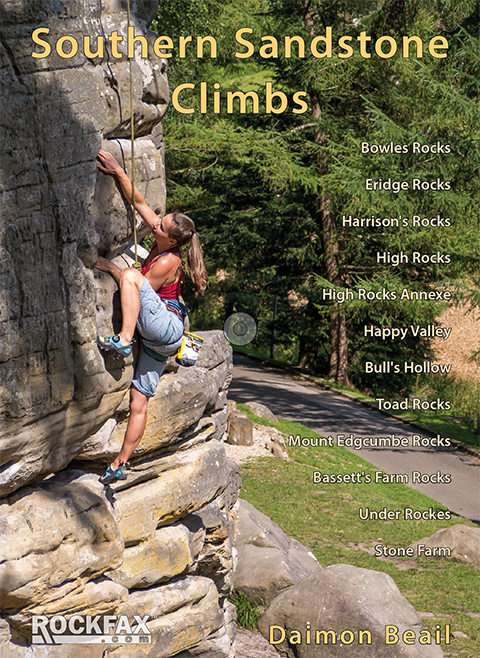 The aim has been to produce a book worthy of promoting Southern Sandstone's unique climbs and the great sandstone environment while stressing the special conservation requirements. Much work has been undertaken to help modernise and move sandstone climbing forward in a new and positive direction particularly with regard to grading and an emphasis on protecting the rock. The general climbing culture is friendly and laid back, with many indulging in weekend picnics while top-roping and boulderring classics at the various crags. If you are looking for hard climbing, this is also the place to be, with some first ascent projects yet to be claimed!